The increasing presence of Multinational Corporations in Tamilnadu has created a new platform for Anita Ratnam and Arangham Dance Theatre to showcase an extraordinary range of work from pure traditional and folk to contemporary and customised creations. The audiences range from delegates around India to international business delegates who are offered a captivating display of India's rich and diverse cultural heritage through music, dance, theatre, costume and sets. 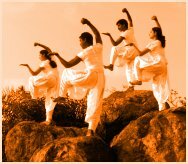 Rooted in tradition, the repertoire uses classical, contemporary, folk motifs and movements to showcase the colour, variety and depth of Indian dance. 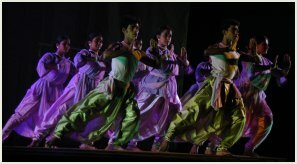 PRAGMA - one such performance - developed its choreography with the vision and mission of Spencer's in mind - a 100-year-old British company with a strong Indian personality. The word was coined from 'pragmatic' to denote a person who believes that change is the only constant in this world... and is open-minded about new ideas and new ideals. PRAGMA used dance, video, masks and speech to signify a company redefining itself for the future. 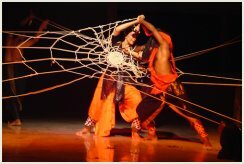 From 2000 onwards, Anita Ratnam and Arangham Dance Theatre have worked even more keenly towards creating "specialised" shows that reflect the image and theme required by corporate clients. The images, choreography and music have been specially defined for the occasion, which range from Company Anniversary celebrations and Product launches, to International Symposiums and Conferences. Saint Gobain Glass, the world's most exclusive glass products company, launched its main factory at Chennai in 2000, which also coincided with the visit of their CEO from France. The event was to be celebrated in a very special manner and ADT showcased BRIDGE - a theme with water as the metaphor, to capture the ephemeral, floating movements of glass. Drawing on the rich dance store of India, the performance also "built" up, the company logo of a bridge, right on the stage and then invited their CEO to join in the celebrations! A special programme on request for a special visitor was Arangham's programme on "AIDS, Youth & Women" for the BILL GATES & MELINDA FOUNDATION. In collaboration with DESH (Chennai), this show was specially performed in November 2002 at New Delhi for Bill Gates! For international gatherings, corporates have requests for a showcase of Indian arts and culture that would inform and entertain members around the world. Two such special shows in 2003 were held for JAIN IRRIGATION SYSTEMS at Mumbai and CHETTINAD SILICA at Chennai. In 2004, Anita and ADT were specially invited for ITC Paperboards Division's annual corporate conclave at Badrachalam. The scintillating entertainment soon had the entire gathering on their feet, dancing and applauding in appreciation! In separate fundraiser shows, the team again performed exclusive performances for Haemophilia Society, Bangalore Chapter and Shankara Eye Hospital, Coimbatore. The crowds that turned up and their joyful responses had the organizers more than pleased with the evening's "results"" A host of other corporate performances in 2004 include a fundraiser for ROTARY COIMBATORE CENTRAL, a special entertainment segment and the compering of the PARLE CHILDREN'S AWARDS CEREMONY by Anita Ratnam at Chennai, an exclusive morning performance at the opening ceremony of the International Jewellery Convention by CRAFTS COUNCIL OF INDIA. Some of the other customised shows offered were scintillating diamond jewellery displayed in choreo-performance for ARISIA DIAMONDS, an evening's select entertainment for iSOFT, highlighting the company's keen sense of innovation and teamwork, a custom-built opening segment celebrating cognizance, the right things, the right way, for the annual day celebrations of COGNIZANT TECHNOLOGY SOLUTIONS, Chennai. 2005 saw a pulsating performance of GAJAANANA at the DUBAI SHOPPING FESTIVAL. This was followed by a high-voltage show at the launch of the INTERGLOBE HOTELS (Accor JV) at New Delhi. THE RIVER was created especially for this launch, building in the joint venture's core values and ideology. "The basic premise of my work is the primacy of Culture. I feel the Arts have been so terribly marginalized that we who work in that area should change it.